This is a very tightly plotted issue, with moments of foreshadowing paid off panels or pages later. Cassandra talks with David about his son, it’s revealed that Woden is his son. Woden flashes back to Sakhmet eating her dad, Sakhmet ends the issue by murdering and eating Amaterasu’s partygoers. These reminders could come off as clunky, but by keeping things short or giving the reveal shortly after the build, Kieron Gillen and Jamie McKelvie keep the pace going. The issue never suffers from too much recapping, despite the fact that much of the issue’s drive is characters learning things that they previously did not know. It’s interesting that despite being unambiguously the most dirtbag character, Woden actually gets a few moments of sympathy, partly due to how he treats Cassandra’s trans status, partly due to the sympathetic reveal of his parentage. Woden’s refusal to dredge up information on Cassandra’s pre-transition life and his acknowledgement that even threatening Cassandra with the reveal of her pre-transition info is a jerk move is surprisingly insightful for this agent of the patriarchy. Once you think about it, of course it makes sense that David is Woden’s father–while these sorts of coincidences rarely happen in real life, the established characters are related reveal happens all the time in fiction, mostly because ‘surprise, your parent is this person we never knew’ is a boring story beat. Sidenote: I know I’ve referred to Cassandra as Urdr in previous reviews but from here on out, since she’s explicitly refuting her godhood identity, she’ll be called Cassandra from here on out. One big tenant of Cassandra’s character is her sense of identity, I’ll respect that in this review as well. Well, that and the suspiciously Innana-like sparkles that show up in a flashback at the end of the issue. As much as I like Inanna, I hope this is a fake-out. Considering Inanna died in our first ‘surprise, this character’s not dead’ retcon, putting a retcon in your retcon is simply too many retcons. Matt Wilson’s coloring is, as always, sublime. The bright, lush oranges of ShinTwo, Amaterasu’s cult, contrast wonderfully with the darker blues and grays of the alleyway where Persephone confronts Baphomet. When Amaterasu and Sakhmet talk about Cassandra and Persephone at the end of the issue, the oranges shift to darker red tones, ending with a terrifyingly impressive splash page of Sakhmet licking her lips, surrounded by the corpses of Amaterasu’s followers. 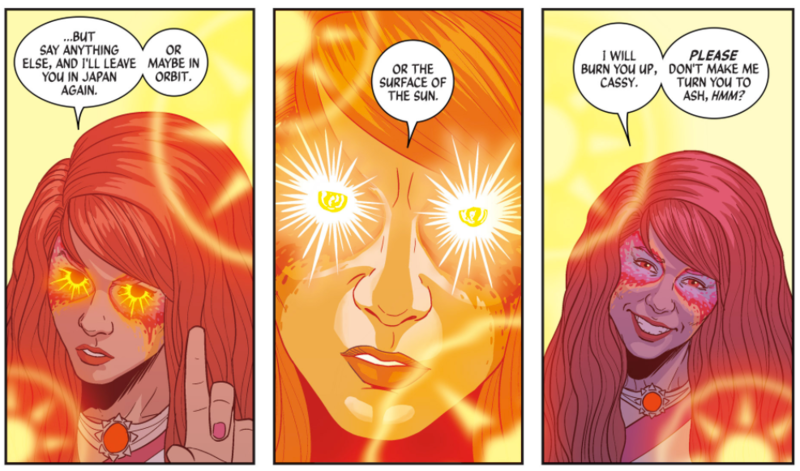 Particularly impressive is the panel where Amaterasu threatens Cassandra: for all of Amaterasu’s posh background and the fact that she’s ‘the nice one’, the vivid coloring underscores this moment of power. Though it’s easy to forget, this, she is a goddess. All in all, it’s an impressive issue and an impressive midway point for the arc. After all, #28 is the end of Imperial Phase part 1. Who knows what’ll happen next? Previous ArticleSurvivor: Game Changers 34x06 Review: "What Happened On Exile, Stays On Exile"
Next ArticleTV Review: The Originals 4x05 "I Hear You Knockin"